There are 50+ social networking websites. Let us take example of the most popular site 'Facebook' to learn Do's and Don'ts of social networking sites. Here are excerpts from the lecture by Prof. Jyoti Zaveri and the related PPT explaining Facebook best practices. Learn about security settings, Groups, Page, and so on. DO and DO NOT of Facebook. Points worth doing and points that one should not do, while using social networking sites, such as FACEBOOK. 1. Do proper security settings to maintain your privacy. Do not share lots of private information with strangers. Avoid sharing information about your children or share minimum. 2. Use private message button for one-to-one communications. Post on the wall is seen by everyone in the contacts and if selected ‘public’ then by everyone. 3. Join group of your interest to interact with your community. You can request for joining by clicking on the button ‘ask to join’. Your friend (contact on Facebook) may add you in a group; however, if you find that the group is not interesting enough, you may leave the group. a. Groups can be public. b. Groups can be private, only members can see the posts and participate. 4. Companies (corporate) are publishing website on Facebook, called Facebook Page. Visit a Facebook Page of a company you would like. Search the name in the search window (on top) to find the page. Click on LIKE button to follow the posts and conversations. 5. Do update your profile with proper name. Upload your proper picture, preferably only face. Do not put picture of a cartoon or joker. 6. Add confirm ‘friends’ only if you know them. If the picture is missing or you have doubt, send a private message to find more about that person. 7. Facebook privacy setting is the most important before you start using the Facebook. Your privacy is in your hand, allow, or do not allow your personal information as per your needs, Facebook has nothing do with it, so you do it yourself. 8. Limit you time on Facebook. Do not get addicted. Commit yourself for not spending over ‘nn’ minutes in a day or in a week. For instance, “limit 15 minutes in a day or in a week”. 9. Facebook suggests names of your friends on birthday, this is a good idea to be in touch with your friends, and wish them happy birthday. 10. Avoid using third party applications (called Apps) on Facebook, these programs before you start using will ask your permission to use your private information by showing a screen with a button ‘ALLOW’, once you click allow, the Apps will use and share your information the way they want. In other words, it is not Facebook but Apps on Facebook is sharing your privacy because you have allowed it. Please share these important guide lines with your friends. Wish you safe and happy networking. You may suggest some points that I have missed out in the comments box provided below. How to attach a file in the Facebook message? You can send a file using the Facebook Message system. Here is the procedure for the same. Start a message in any of the following ways: Click the "Message" button at the top right of your friend's profile (timeline). Click on Send a New message - OR - Select "Messages" in the left column of your home page, and click the "+ New Message" button. Enter the name of your friend or an email address. Recipient/s or people to whom you sent the message will be notified by email, or the next time they log in. Try it using Facebook, it works! An email attachment is a computer file sent along with an email message. One or more files can be attached to any email message, and be sent along with it to the recipient. This is typically used as a simple method to share documents and images. 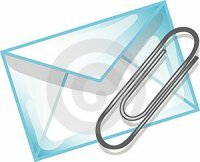 A paper clip image is the standard image for an attachment in an email client. Above procedure was tried using Prof. Jyotindra Zaveri id. Do you think we could begin to phase out email completely, and never get spam again? Did you Like this tip ? Would you like to add something? Post a comment below. If you find the same helpful, please share with others using social icons given below.